For over one hundred years, the principle that the shoe has to support and guide the foot, has been valid in the shoe industry. This basic principle has been deeply embedded in the consciousness of physicians, shoe manufacturers and consumers. Even today physicians prescribe orthopedic arch supports for problems with feet, knees, hips, and back. The causes of the complaints, such as lack of strength, coordination, and movement of the foot, are often not recognized and only the symptoms are treated. In 1996 the engineer Karl Müller invented the MBT shoe, revolutionizing the shoe industry with its “rolling sole”. Now, with the ‘walk on air’ principle, Müller is going a step further. 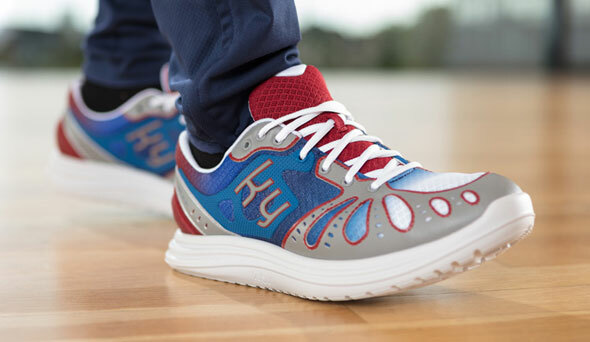 The kybun shoe creates an unprecedented level of comfort as you walk and is unlike any other shoe. What makes the kybun shoe special is its air-cushioned walk-on-air sole. Every step momentarily launches you into weightlessness; the soft, supple sole gives your foot maximum freedom of movement. The sole of the kybun shoe is the world’s first sole that allows feet to feel every detail of the floor. The soles of your feet will be gently stimulated with every step. This incredible innovation really comes into its own when you walk on gravel or cobblestones. How do kybun shoes help? kybun shoes are suitable for numerous medical complaints and problems and can be used to supplement conventional treatment, provide relief in everyday life or as a preventive measure to avoid muscular weaknesses and joint complaints. What it all comes down to is your gait – a person’s manner of walking. Let’s examine how our gait affects our all around health. It all begins with your feet. Strong feet make healthy people! Click here to learn how your feet are key to a healthy body!